The uniform represents a democratic ideal of equality. Boys from various cultures and different economic levels wear the same uniform and cooperate as equals. The uniform identifies a boy as a member of the Cub Scouts. Badges on the uniform tell other members that he belongs to their den, pack, and council. The uniform itself identifies a good citizen to the entire community. The uniform displays badges and other awards so the accomplishments of each Cub Scout can be immediately recognized. Wearing a uniform is a constant reminder to each Cub Scout of his commitment to the ideals and purposes of Cub Scouting: duty to God, loyalty to country, and helpfulness to others. One of the first things you'll want to do when your son joins Cub Scouts is buy him the uniform. There are several Scout Shops in the area, or you may purchase it online from ScoutStuff.org. The basic shirt comes with a U.S. flag patch on the right shoulder and "Boy Scouts of America" embroidered over the right pocket. Blue shirts are for Tiger Cubs, Wolves, and Bears; khaki shirts are for Webelos. (Webelos can wear their blue shirt if it still fits. The khaki shirt can carry over into Boy Scouts.) It is generally recommended to purchase a short-sleeved shirt. Your son can always put a long-sleeve shirt on underneath his Cub Scout shirt when the weather is cool. The patches you need are the Great Lakes Council patch, 2-3-1 white on red pack numbers, world scout crest, and den and patrol patches (once those are assigned). Scouts also need a rank-specific hat and a belt. Everything you need is pictured at below. Location: Left Shoulder, top. Note: the older "Great Lakes Council" patch is still acceptable to use, but will no longer be sold in stores. Each den may have a Denner and an optional Assistant Denner. The Denner's job is to help the Den Leader, who determines specific duties. 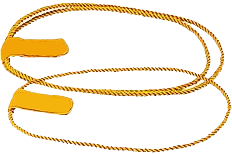 The Denner wears two yellow cords over his left shoulder. The tab is pinned to the shoulder, and the Denner's arm goes through the loops. The Assistant Denner wears a single cord. Cub Scouts tend to accumulate a lot of patches, but only a few of them belong on the official uniform. One solution is to purchase or make a "brag vest" and sew patches onto that. This felt vest is available for around $15 at the Scout stores. Pack 236 also has two brag vest templates that some dens have used to make their own vests. The Scout stores have pants, shorts, socks, etc., which are strictly optional. Here are diagrams of where patches go. Adult leaders wear the khaki-colored uniform shirt. The patches you need are the Great Lakes Council patch, 2-3-1 white on red pack numbers, world scout crest, position patch (Cubmaster, Den Leader, Assistant Den Leader, etc.) and den number and patrol patches. Blue shoulder loops go on the shirt shoulders. Once a leader has satisfied the requirements, a Trained patch can go on the right sleeve, above or below the position patch, depending on the shirt style.